Italian fashion brand Byblos will launch Byblos Butterfly, a new fragrance for women. Self-confident, determined and feminine, this fragrance incarnates a butterfly with a rock attitude. Notes for the fruity floral include peach, red currant, freesia, magnolia, crocus, neroli, jasmine, musk, white wood, patchouli and cashmere wood. 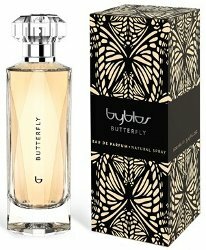 Byblos Butterfly will be available in 100 ml Eau de Parfum. Like the name, box design…but ‘rock attitude’ gets thumbs down. Really? Couldn’t come up with anything better than that? Not sure I’d like the scent either, who knows. I wish they etched the butterfly from the box onto the bottle, that would be legit. But then I may want it just for the bottle. Seriously, rock attitude is getting old.